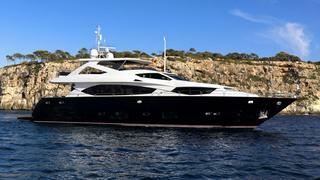 News just in from Camper & Nicholsons that their listing for sale, the 30m flybridge motor yacht Paloma, is sold. Paloma was built by British superyacht yard Sunseeker International and, delivered in 2009, has had the same owner since new. A custom interior by Botero Interior Design features lacquered cherry wood teamed with luxurious fabrics and leathers throughout. Eight guests are accommodated in four staterooms comprising a main deck master suite, VIP stateroom and two twins. All staterooms have en suite bathrooms in fine marble and stone and one of the twin cabins can convert into a double and the other into a study. Outside, the three deck layout offers several al fresco dining and sunbathing areas, featuring an entertainment system, bar and barbecue. For those seeking relief from the sun, there is an electric Bimini top on the flybridge and a covered aft deck. Twin MAN diesel engines give her a comfortable cruising speed of 20 knots and she is fitted with zero speed stabilisers.